Here are two species recorded in small numbers during the Autumn months, with genuine migrants often being very hard to discern from resident birds on commuting flights to and from feeding areas. As such, both species are probably under-recorded on migration at sites throughout the county. Most movements may be attributable to local short-distance movements, though genuine long-distance migrants certainly do occur. Away from the period mid-November through to late January, Reed Buntings tend to leave the Eakring Flash area and mix with finch/bunting flocks at other sites within the area through the Winter months, quite often almost completely vacating the area entirely. Yellowhammers also, similarly disperse to other areas over the Winter months. The above table shows the accumulated migration totals for both Reed Bunting and Yellowhammer through the area from 1998-2001. The second week of October has produced the most consistant daily movements over the period of study, with smaller numbers (probably accounted for by Continental birds) coming during early November. Records show that both species tend to show a pronounced bias towards a south-westerly or westerly direction. Undoubtably some individuals fly through at a lower level rather than high up. Certainly here, Yellowhammers seem to fly higher than Reed Buntings and both species frequently come in from the north or north-east, land in suitable habitat to feed around Eakring Flash, before continuing further on to the south-west. Migrant totals within the last four years, have included 166 Reed Bunting and 272 Yellowhammer, with highest daily counts for each species, yet to reach more than twenty birds. The Reed Bunting migration pattern since 1998-2001(above) shows how migratory patterns differ from year to year. Years are represented by red (1998) blue (1999) yellow (2000) and finally brown (2001) The bulk of the Reed Bunting records have come during the second and third week of October, although migration continues from late September until the middle of November. Another concentration of records can be seen to occur during the first part of November, this is also in-line with the Yellowhammer, but there were no records of migrants during November 1999. 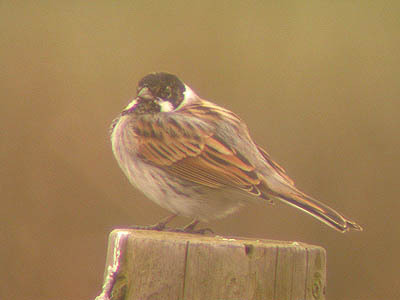 Most of the Reed Buntings identified in flight have been female/immature types, with very few adult males recorded. Yellowhammers produce a pattern of occurrence, quite similar to that of the Reed Bunting. This has been especially so for Autumn 1999 (in blue) when a much shorter and more concentrated period of migration by both Yellowhammer and Reed Bunting was recorded and similarly as with Reed Bunting, there were no migrant Yellowhammers recorded during late October and early November.